Acoustic quartet, rock combo or wandering marching band, Ethnophonics is a geometrically and geographically modular orchestra combining talented musicians from France and Turkey. Drums and brass, reeds and skins, stings and accordions all improvising together, swaying with creative and roving effervescence. ETHNOPHONICS was born on the road, from a need to play, to travel, and to share. 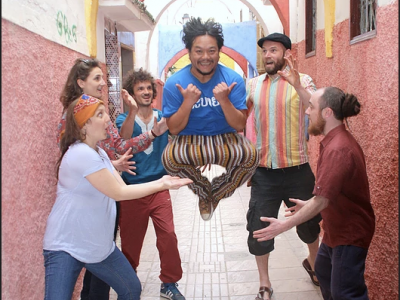 From Lille to Istanbul, via New Orleans, ETHNOPHONICS is an orchestra in perpetual movement, which integrates people and melodies encountered along the way and reconfigures itself according to chance encounters. Following an initial self-produced tour of Istanbul in 2015, the French Institute in Turkey asked the group to create a multidisciplinary spectacle uniting French and Turkish musicians. In June 2016, after a 2-week creative residency in Istanbul and Ankara, ETHNOPHONICS toured 5 Turkish cities with their new project which mixes music and video with live musicians interacting with landscapes and images of musicians they encountered between the Atlas and the Bosporus: “UBI QUE”.